Enjoy the great outdoors and make it a family thing! Dove Hunting with my Boys! I had a great day with my boys on the opening morning of dove season. We headed out about 5:30am and headed over to Granger Lake WMA. The spot I wanted to sit was over run with hunters, so we moved a little west and set up next to a cattle pin and some sunflowers. The birds were already flying around us and after telling the boys what area they were responsible for we got ready. The first few that were in range I let the boys shoot at them with their new 20 gauges. After the new was shot out of those shotguns I decided to let some lead loose too. We got three from that spot, but it wasn’t from the lack of not having birds around us. The boys just couldn’t connect on those low fast flying birds. Later in the afternoon we headed to the big sunflower patch were it sounded like a small war was going on that morning. After getting something to eat we picked a spot to sit for the afternoon hunting, set out or seats and bags then went back to the truck for a nap. Around 3:00pm we marched out to shoot some birds. The birds came in spurts. Colby was filling the sky with lead and finally he started connecting making a couple excellent shots on some fast moving birds. 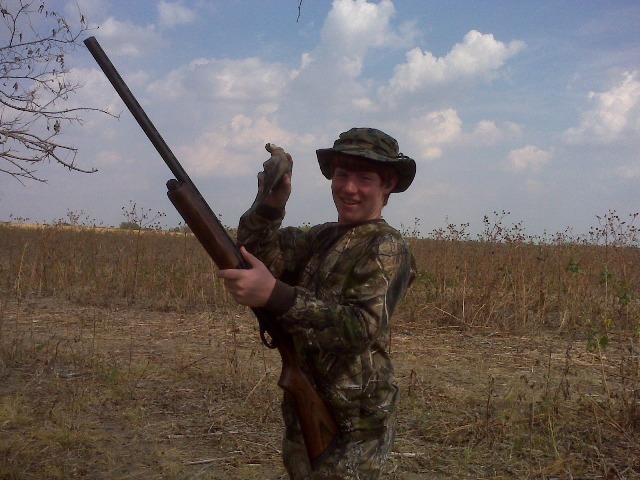 This was Alec’s first dove hunt so, I set my gun aside and was bird watching for Alec and wished to see him take his first bird. After several shells he was getting discouraged since he hadn’t shot one. So, when a dove landed in a tree about 50 yards away I told him to take aim and shoot at it. Alec shouldered the stock of his Remington 870 Youth model shotgun, raising its 21” barrel and putting the Tru-Glo fiber optic sight on the unexpecting bird. Squeeze, BANG! The gun fired and the bird fell. 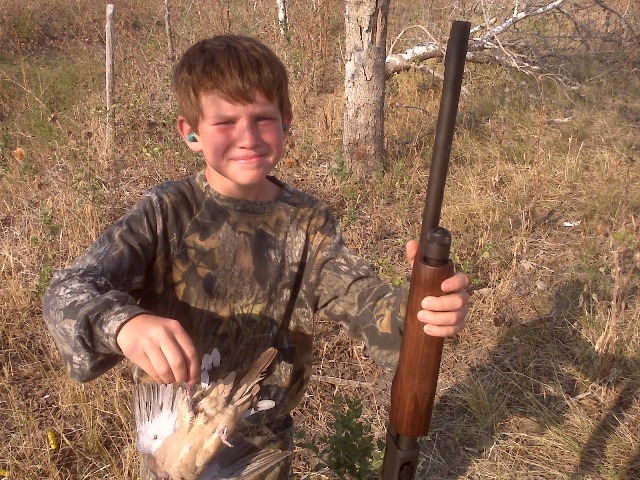 I was amazed…we headed out and retrieved his first dove. It was a great day and I always enjoy taking the kids hunting.